Back in 2006, Nike released a pair of PlayStation-inspired Air Force 1s that instantly became one of the most coveted sneakers of all-time. Nike went on to destroy “nearly all round one samples of the premium leather version” as part of the production process, thereby cementing its rarefied status. Fast forward to June of 2018. Nike is teasing another PlayStation collaboration, and rumor has it that the new sneakers might drop as early as today, June 11th, ahead of Sony’s E3 2018 conference that kicks off at 9PM ET. Indeed, rumors are flying everywhere that this new collaboration will be sequel to the original PlayStation AF1s, and a Drew League Instagram post leak (which appears to have been deleted but is available to view via pinoe77 below), indicates that the design will be a bit more subtle than the original with a smooth black leather upper and a jeweled Swoosh logo with matching PlayStation branding on the heels. 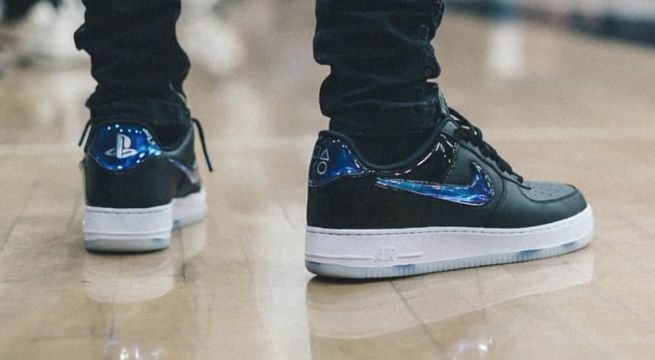 Now, if you were hoping to get your feet in a pair of the new PlayStation x Nike AF1s, you should know that your odds are going to be very, very low. If the sneakers are real, and they are released during E3, they will likely be available through SNKRS for all of a millisecond before they sell out. Such was the case with Nike’s release of Paul George’s incredibly awesome Nike PG-2 PlayStation Colorway sneakers back in February. They could also drop via SNKRS Stash. Stash works through the SNKRS app, and involves unlocking exclusive products that are hidden throughout your city. Yeah, just fuggetaboutit. Again, Nike hasn’t confirmed anything about the PlayStation x Nike Air Force 1s at the time of writing, so take all of this with a grain of salt. However, you might want to keep tabs on the SNKRS website and app for more details as the day goes on just in case. Honestly though, if you’re really committed to owning a pair, you’ll should prepare to spend big bucks on the secondary market.